You and your fellow samurai companions are the only standing obstacle between one frightened village and a full horde of blood-thirsty villains. The fight seems unfair as the seven of you might not seem to measure up to the dozens of enemies who want to slice you to pieces — but this comparison doesn't take into account your strong combat skills and an efficient team spirit that binds your samurai squad enough to face the threat. Above all else, when everything seems desperate and lost, your enemies will discover that inside each of you lies a true beast, a warrior spirit ready to unleash its full power! 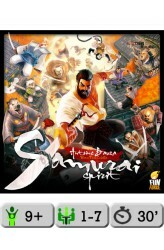 Samurai Spirit is a co-operative game in which each player is a fierce samurai defending a village surrounded by a horde of bandits. The game plays out over thr.. 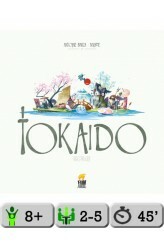 In Tokaido, each player is a traveler crossing the "East sea road", one of the most magnificent roads of Japan. While traveling, you will meet people, taste fine meals, collect beautiful items, discover great panoramas, and visit temples and wild places but at the end of the day, when everyone has arrived at the end of the road you'll have to be the most initiated traveler – which means that you'll have to be the one who discovered the most interesting and varied things. The potential action spaces in Tokaido are laid out on a linear track, with players advancing down this track to take actions. The player who is currently last on the track takes a turn by advancing forward on the track to their desired action and taking that action. So, players must choose whether to advance slowly.. The Tokaido is ready to unveil a few more treasures for the most faithful Travelers: cherry trees in full bloom, luxurious bathhouses, good luck charms, calligraphy, legendary objects, and even clandestine gambling rooms are now part of the journey! 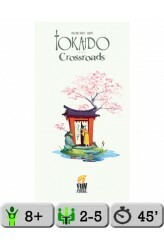 Tokaido: Crossroads, an expansion for the game Tokaido, will open up new doors and many new possibilities to make your journey even richer and more strategic. 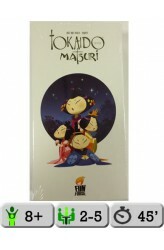 ..
Matsuri is an expansion that will bring new cards and tokens to the game. With this expansion, the players will live the Japanese feasts and festivals. These cards will modify the way each section of the road will be played. This won't transform the game but it will add even more depth and strategy to it in the same way that Crossroads did. A smart and fresh idea from Antoine to bring even more gameplay exclusive content to our fellow Samurais (and up) supporters! Per back of box... "The traditional Japanese festivities and sixteen new travelers are now part of the wonderful Tokaido journey. These Matsuri (the Japanese word for festival), triggered by the arrival of the Travelers at the intermediate Inns, punctuate the path with new and unique events." ..